In the summer, some of the delicious fruits and vegetables are in season. 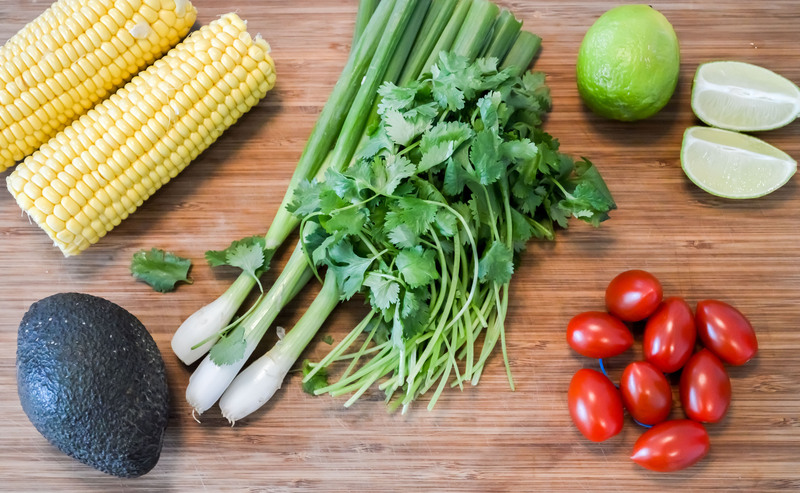 That makes it the perfect season to eat fresh, seasonal local produce as much as possible. I have been working hard this summer to develop some new recipes that are fresh, bright and sparky, to reflect everyone’s mood and keep us all healthy. However, today rained loads in London. And it will continue to rain all week. Bleurgh. So even though I was keen to eat loads the beautiful fresh veggies I have been seeing all over the organic fruit and veg shops in my neighbourhood, I am also craving something warming and a bit naughty. Call me crazy but that’s what I want when my toes have been wet all afternoon. The answer to this conundrum is CHILI. Of course, fresh AND warming. BAM. So I have been trawling through recipes online and I found a gem from Martha Stewart. It’s fresh, it spicy and it’s delicious. It also features a delicious chunk of pork. YAS. 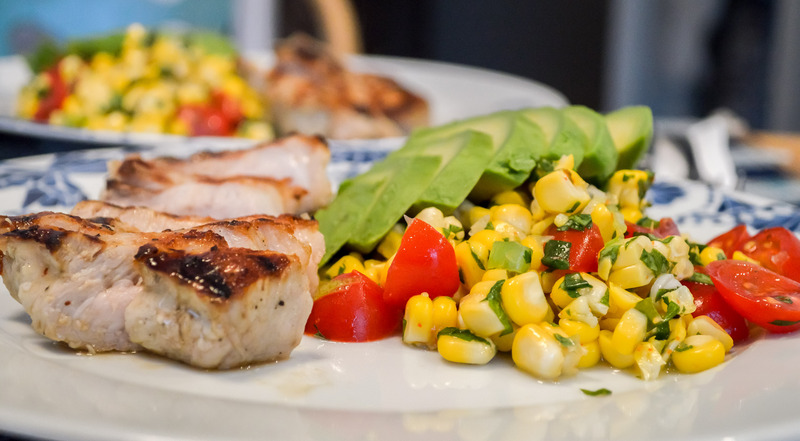 Chili-Lime Pork with Corn, Tomato and Avocado Salad. First up, marinade the two pork loin steaks with a glug of olive oil, salt, pepper and chili powder. Let the flavour really get in there. Keep the pork in the marinade until you are ready to cook (and eat). Boil the corn for 5 minutes in a pot of salted water. Drain and rinse under cold water to cool. 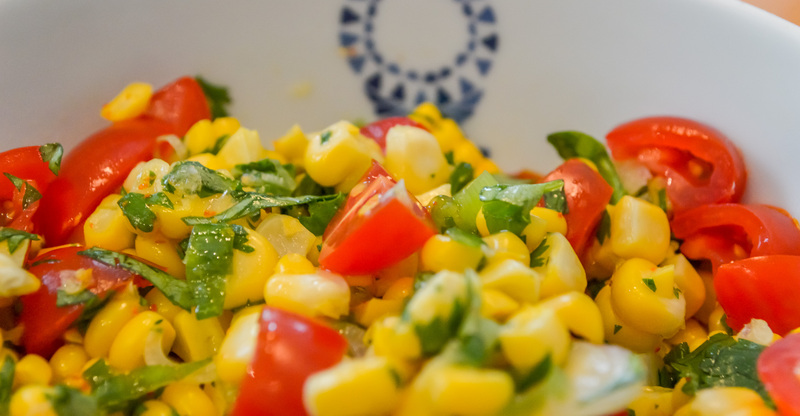 With a sharp knife, cut kernels from cobs. THIS GETS MESSY, use a big place and don’t be shy. 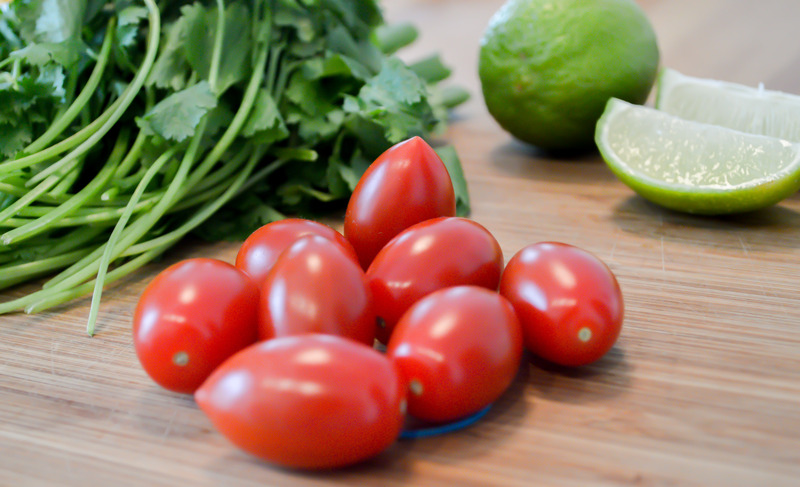 Transfer to a bowl and toss with the spring onion, coriander, tomatoes, avocado, 2 tablespoons oil, and juice of 1 lime. Season with salt. Save the salad for a bit. Heat a grill or grill pan to medium-high. Grill the pork for 6 or so minutes per side for medium. Remove from grill and squeeze juice of remaining lime on top. Enjoy with the salad and some delicious cold beer or fresh juice! my pleasure. thanks for reciprocating! Adorei,vou fazer! Tô com foco-me!